Liam Neeson is one of a handful of mid-career Renaissance success stories in Hollywood. Action movies had always been sprinkled throughout his career resume, but in the last decade, he’s remade himself as an action hero with the Taken series and other standalone movies like The Commuter. Chances are if there’s a movie and Liam Neeson has a gun in it, you know exactly what you’re getting–except in cases like Cold Pursuit, where, well…you don’t. The movie is a remake of the 2014 Norwegian film In Order of Disappearance, and it has a lot of fun with that premise. Intrigued? Read on for three reasons why you should see Cold Pursuit in theaters. What makes this movie stand out from the rest of Neeson’s action-oriented body of work is the dark humor. It’s not quite as well-executed as, say, In Bruges, but it’s game to go weird places. Neeson’s world-weary gravitas is used to great effect as he drops deadpan lines throughout the movie and approaches the act of killing with a grim, dogged determination that injects an element of the absurd throughout. We’re used to seeing Neeson as the man in control, the hunter with unmatched skills and an almost superhuman ability to track his prey. Not so here. Nels Coxman is simply a blue-collar guy, a one-man road crew in a tiny mountain resort. He is in way over his head when he decides to start killing the bad guys – who knew carrying dead bodies would throw your back out, or that it takes an awkwardly long time to strangle someone to death? Definitely not Nels Coxman. The movie also delights in poking fun at the absurdly high body count of action movies, with a running tally of who gets whacked when and in what order. While there are certainly some laugh-out-loud moments, the tongue-in-cheek humor is blacker than you might expect. The movie settles into a groove; there’s a zany kind of fun in knowing a character will inevitably be killed in any particular scene, it’s just a matter of how. Hitmen stand holding severed heads as the rest argue about who has to dispose of the bodies; the camera winks and nods at just how disposable those bodies are. Almost everyone in the movie is a walking corpse, they just don’t know it yet. Another name gets added to the growing list of deceased and they move on to the next. Sure, Nels Coxman might have to take a literal knee after he exerts himself beating up a guy, and yeah, maybe he gets his ideas on body disposal from reading crime novels, but it’s still Liam Neeson. Unpolished or not, he gets the job done. There is a lot of pistol-whipping, a lot of punching (like, a lot of punching), and a lot of heads and chests exploding into a bloody spray at point-blank range. Granted, once the two rival gangs jump into the action, the killing is equally distributed between them and Nels, but Nels is the one who jumpstarts the chain reaction of increasingly creative murder. For a guy who has no clue how to go to about working his way through a criminal organization to get to the kingpin, Nels is surprisingly efficient and creative in his methods. Why have the best heavy-duty snowplow model on the market if you can’t use it to occasionally get rid of a body or twenty-seven? 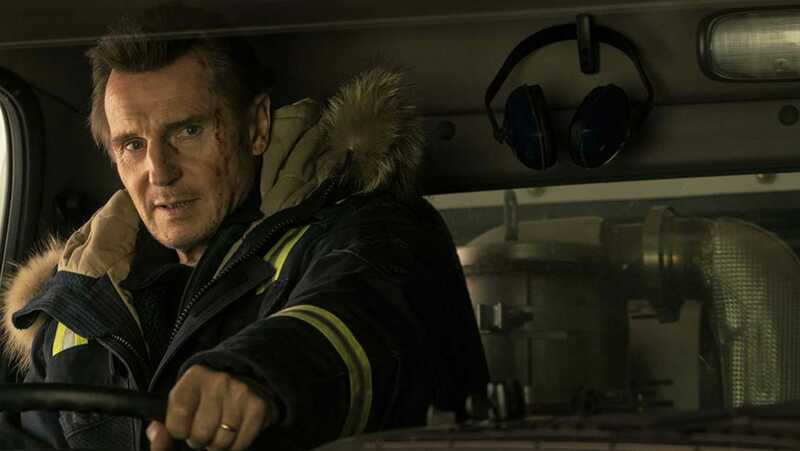 Nels may fumble his way through most of his murdering, but killing is killing and Liam Neeson is just as effective in Cold Pursuit as he is in Taken…it just may take him a little longer to get rid of the evidence. There are three main female characters in the movie, and not one of them is to be trifled with. The smallest role goes to the biggest name, Laura Dern. While she peaces out of the movie about a third of the way through for reasons I won’t spoil, her departure is one that leaves one hell of an impression, and that impression is a giant middle finger. As for the other two women in the movie, they are equally as formidable. Emmy Rossum plays her rookie, small town cop as eager for some action to the point of overzealousness. She’s not afraid to mess with the affections of her ex to get insider intel from him to do it, despite the finger-wagging and tut-tutting of her older male partner. She’s as determined to track down the killer as Nels Coxman is to do the killing, and it’s typical that she actually has her finger on the pulse of what’s going on but is dismissed by the rest of the police force. But the standout character holding it down for the ladies is Julia Jones’ Aya, estranged wife to crime kingpin, Viking (Tom Bateman). Viking might be a psychopath and a killer who strikes the fear of mortality into everyone in his orbit, but Aya is neither impressed by nor afraid of him. She has him figuratively (and quite literally, in one scene) by the balls thanks to the custody they share of their son, and no amount of his threats or mental games rattles her. She’s the only one in the movie who dares put him in his place, and she does so over and over again, not giving one single, solitary damn what he thinks. Their interactions are so cutting and acerbic as to be things of beauty, but there is never a point in which she doesn’t have the upper hand. She is every woman who has ever been 110% over her douchebag ex, and it’s magnificent. If you’re looking for action with a lot of unexpected humor, this is your movie. Cold Pursuit is in theaters on February 8th. You can get your tickets here.